Space activities are often more expensive than a single space actor can afford. 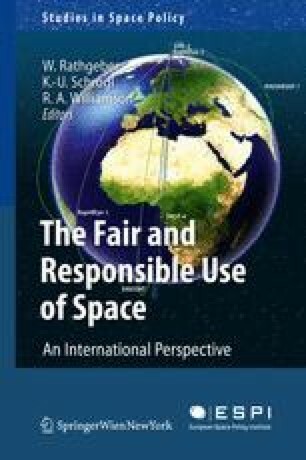 Besides, they are inherently global by nature, and they are increasingly being recognised as a tool of diplomacy.103 Accordingly, in the space sector there have been cooperation schemes at the international level or between partners at other levels right from the beginning. These cooperation schemes can include all phases of project execution: They might range from concerted system definition, design and development to joint operation of missions; from shared funding to a common utilisation of data gained by space activities. Data often represent the major objective of such activities, so their handling will be discussed in more detail here.